Ryuhei was born in Tokyo on May 9, 1983. He is the son of the famous actor Yusaku Matsuda and the actress Miyuki Matsuda (Audition). He was six when his father died and had no plans of going into acting. He was approached however when he was fifteen by the director Oshima Nagisa, who wanted him to star in his samurai movie Taboo (Gohatto). After that role, Ryuhei discovered he enjoyed acting and shortly after dropped out of high school to pursue an acting career. He is currently a very popular and sucessful actor in Japan. RyuHanako Jul 02 2018 7:15 pm I fell in love with him after watching him in "Eigyo bucho Kira Natsuko". Right when I first saw him I was strongly impressed by his eyes! The sharp- shaped eyes with a cold eyesight. However, at first I didn't really like him, instead I was afraid of him! Really ? Maybe because of his cold eyes ? After that his acting pursued me so much and made me to fall in love. I think his acting style is very unique, it's totally different to other actors! Gentle, calm, indifferent but also very careful, thoughtful, introvert... are what I think about him and his characters he played! Reya Dec 28 2016 2:39 am Any recommendations of more 'emotional' movies with him? He plays the serious, stoic role very well, but I guess I want to check out more of his work since I've continuously seen people rave about him. I think he was great in Mahoro Eki Mae Bangaichi. Eat Oct 09 2016 9:38 am Anyone knew anything about his private life? About his wife and daughter. Why there was not any family photo in any media? Why it seem to be so secret and privacy? or this is normal for Japanese actor. RyuAngel May 04 2015 8:50 am He is just amazing *_*. Beautiful, talented full of everything that a good actor need. I have seen some of this movies (a.e. nightmare detective 1&2, Mahoro Ekimae Tada Benriken, Mahoro Ekimae Kyousoukyoku ) , his series and so on. just love him. waiting for his upcomming movies. RyuShota Apr 25 2014 12:55 pm @FeKimi: I am quite disappointed when knowing that he just got a very few line :( but i am glad i read your comment ∑(´▽｀ﾉ)ﾉ! Super excited to hear his Japlish English hahaha I guess its absolutely cute, right?! 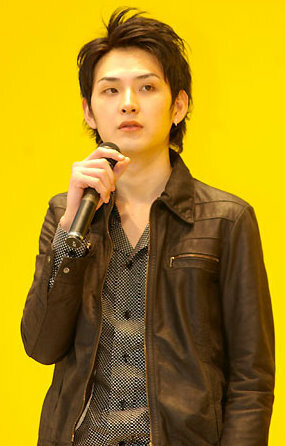 I am fan-girling too with you here (*≧艸≦) so much love for Ryuhei-san! lontong.stroong Mar 26 2013 3:01 am All hail Gyoten!!!! Lil'Tokyo Dec 16 2012 8:01 am Loved him in Blue Spring! <3 Even thought I didn't really understand the movie/meaning behind it.... BTW his eyes got something i dunno what it is but i really like it! non sibi Nov 10 2012 6:30 pm and his wife is Rina Ohta. FeKimi Oct 31 2010 10:08 pm He's definitely a great actor with a strong performance!! My favorite film of his is "Blue Spring" and also his 2 movies "Rampo Jigoku" and "Nightmare Detective2" are become The 50 Best Asian Horror Movies in This Century... Great Job, Matsuda-sama!! Can't wait for your future movies!! Hummy Jun 01 2010 3:46 am I first saw him in Blue Spring and thought he was exceptional. Since then, I've tried to follow his film work, it seems very apparent that he makes excellent choices for films that vary in style and genre. yoru Jan 06 2010 9:14 am I've watched most of his movies and so far they are really great. The only movies shown in the list that i can't find are Happiness in August, Izo, Chosyu 5, Purukogi and Life Can Be So Wonderful. Arinay Dec 26 2009 1:00 pm He was very cool and awesome when he played as Ren in NANA! !